Since the New Year just started, it’s a good time to set some goals. Whether you are a freelancer, a small business owner or a blogger with a 9-to-5 job, goal setting is paramount if you want to make the most of your year. Wait, did I say goal setting? I mean SMART goal setting. Read on. If we don’t have goals, chances are we won’t achieve what we have in mind. You know I am a fan of planning, right? Well, if you have no goals, there’s no way you can make a good plan – as you won’t quite know the destination you want to reach. There are a lot of people who do set goals though. But still – they somehow fail to meet them – because the goals were unrealistic, or couldn’t be measured, or were way too vague to pursue… So I urge you to set SMART goals! 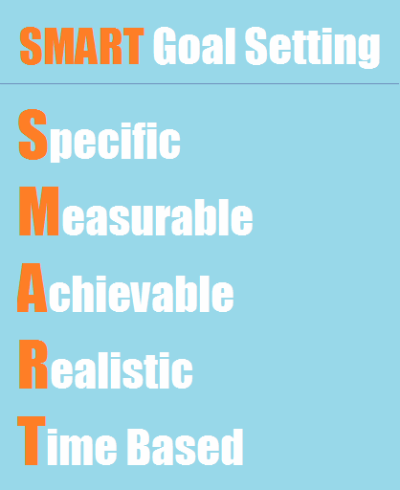 Set SMART goals – specific, measurable, achievable, realistic, and time based. If you are a freelancer, you may want more clients. So don’t just set a goal of “finding more clients” but be specific: what type of clients (new/repeat, writing/editing, graphic design/logo design), how you get them (via freelance websites, or directly pitching companies), when you do that (on monthly basis or quarterly, or yearly). If you are a small business owner, you too may want more clients but similarly to the freelancers, don’t just pledge to get more clients. Be specific – what type of clients (new/repeat, users of service A/Service B, sourced from SEO/SMM, etc. ), how you get them (via your website, or blog, or email, or offline marketing, etc. ), when you do that (on monthly basis or quarterly, or yearly). If you are a blogger, you probably want more readers, or more email subscribers, or more comments. But again – be specific. More repeat readers, or RSS feed subscribers, or more loyal readers who come from Google organic search, or more comments on each post you publish, else? As a general rule of thumb, specific goal setting boils down to answering the 5 W questions – who, what, when, where and why. Specific goals answer the 5 W questions – who, what, when, where, and why. If we continue the example from the “specific goal setting” section, I will use clients and readers to illustrate the “measurable” aspect as well. For a freelancer, it can be 10 new clients from freelance websites and 5 of them long-term. For the small business owner it can be 250 new clients from the website and 1000 items of product A sold online. For the blogger it can be 1000 unique visits per month combined with 30 new comments per week. Measurable means you put numbers on it – how many or how much of something you want to achieve. Measurable goals tell you how many or how much of something you want to achieve. Now that we have made the goals specific and measurable, it’s time to make sure they are achievable, too. The name speaks for itself – achievable goal means it is something you can achieve. If you are just starting as a freelancer (e.g. writer or marketer), you most probably won’t achieve $500K income during your first year, right? Or if you are a startup, during your first year you probably won’t break even and won’t have revenue of $500K, right? Or if you are a starting blogger doing everything yourself, you most probably won’t achieve the fantastic 5K unique visits per day, right? You see where I am going… when making your goals achievable, answer the simple question what you are prepared and able to commit to. It is ok the goals to be challenging and difficult – but make sure they are actually achievable. Realistic is pretty similar to achievable. And we can even take an unachievable goal and turn it into a realistic one by stretching its time table. That very same starting freelancer who wanted to make $500 income – while they most probably won’t make it during their first year, they may very well do it in the first 5 years. So by stretching that goal from 1 to 5 years, we make that goal realistic (and achievable). And if there was a most important ingredient of the SMART goals, time-based would be it. Put yourself a deadline. Put yourself on a schedule. Do you have any idea how many freelancers, small business owners and bloggers have failed to meet their goals because they didn’t add a time frame to it? Yeah, I thought so – me neither 😀 But that’s not important. The important thing is that only if we put a deadline for our goals, we can start planning how to achieve that goal. Add a timeframe to your goals so you can start planning how to achieve them. Find 10 new freelance clients until the end of June, and until the end of December, at least 5 of them to hire me on long term basis. Sell 500 [products] through my website www.website.com during 2014. Acquire 3500 new loyal readers of my blog at blog.com through social media networking. Finish the first draft of my book about [topic] before the end of Q1 2014 and publish it no later than end of Q2 2014. Blog twice per week every week until Dec 31, 2014. Each week, publish 1 blog post about [topic 1] and 1 blog post about [topic 2]. Over to you – do you set SMART goals and how it helps you (or not)? Right. You know what, Lisha? I am amazed how many people today don’t really set goals, even business owners. They just “wing it” – as if you can run a successful business like that. But yes, you’re right – if you are smart enough to set your goals, then be sure to make your goals smart as well 😉 Thanks for dropping by! I’ve realized I don’t set goals that are specific enough or measurable enough either. It’s a process, but I’m gradually learning new habits. The important thing, Jeri, is that you do set goals – the other part (the smart part of the goals) – it’s something you can learn. As you said – gradually learning new habits and i congratulate you for it! Diana- When I first started my business I am one of those who would just wing it and I prayed alot. After awhile the praying didn’t work so I had to sit myself down and really figure out where I wanted to go with my business. If you are not specific in what you need to accomplish, it is just like being in a row boat in the middle of the ocean. Oh, Arleen, i cannot believe you have been one of those not goal setting business owners. 😀 Congrats, you have come a long way – we all learn, i guess. You make a great point about checking off goals and adding new ones – It is excellent that you raise the bar just a little higher every time you achieve a goal. Thanks for adding this to the conversation! Hi Arleen, prayer is good, but you have to do your part. God is not going to do everything for you. You did the right thing. You can pray for guidance, but once you get it, follow the blue prints. Blessings. I have always set goals. Never called them “smart” goals, but after reading this post, they were what you have alluded to. I was blessed to have owned four thriving businesses. Goals were set for each one, and because of it, each was met. My goals were never unreachable, as I didn’t want to set myself up for failure. Some individuals will never reach their goals, as they are unrealistic. If you set them up too high, you’ll fail. Too low, and you will get into a rut. Setting goals beyond your reach, is tantamount to a 5 ft, tall person, attempting to high jump, 9 ft. Thank you, Diana. We need to set goals, if we are to accomplish. We can not lead a Zombie like life. Blessings. Now when I think about it is so easy, but it wasn’t before I read your post. And I had several goals for 2015, but it is march already and I don’t have real progress. Actually I was very careful when setting my goals and I was almost using your SMART principle with one thing missing there: S – Specific. Having this in mind I am right now rearranging my tasks and creating new ones that will help me with my goals. Hi, Aleksandaril – I am glad this comes to you at the right time. You’re right it is March, but it could have been August – so go, tweak your goals and start making small steps to achieving them. Glad that I gave you an a idea, and happy to read your post because it was helpful for me. Thanks to this post and to your other post (https://www.dianamarinova.com/big-picture-yearly-time-management/) I have changed the priority on some plans/tasks. Since then in record period of time I have completed and published 2 items on envato market, and currently planning my 3-rd item. With this I am officially starting to work on one of my goals for 2015. However, writing about Envato is a bit out of my niche of expertise – I always thought it is for music licences (that’s what we used it for on one of my startups) but when I looked deeper now, I see there are a lot more things on it. Nevertheless, there’s nothing for me there, at least not as a freelance marketing consultant – so I won’t be doing any writing about it. Cheers to a very successful 2015! While it is too soon to know if there will be any revenue from my work on Envato, it definitely was one of my priorities to at least try there. And thanks you your posts the priorities got real order. Not just some flying in to air plans that eventually will happen. Now I have detailed plan that I am executing little by little, working on just the most important things – one at a time and not spread around on everything like in 2014. I have subscribed to your newsletter, just to make sure I stop by often and read your helpful posts.